We’re going to keep this one brief, because sometimes the best (read: most ridiculous) things in life deserve as little explanation as possible. I (Vijay) would like to take credit for this one but, in reality, all kudos for this idea goes to my Easter (and Peep)-obsessed colleague Kate who insisted that we had to make this happen. Ask and ye shall receive Kate! 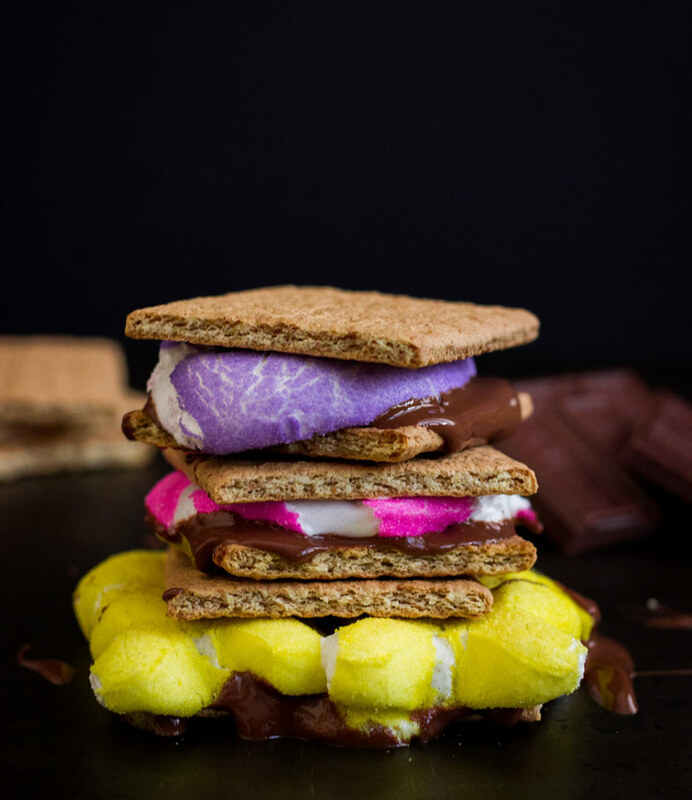 After all, Peeps are just neon-colored, sugar-coated marshmallows so they make the perfect insertion into classic s’mores. If you have a fire pit, skewer these little guys onto a stick and roast them up (and please, send us a picture) or, if you’d rather stay inside, make them in the oven like we did (more on that below). To make things a little more fun, and since this is more of an idea than an actual “recipe,” this felt like the perfect opportunity to play around with our first animated GIF. 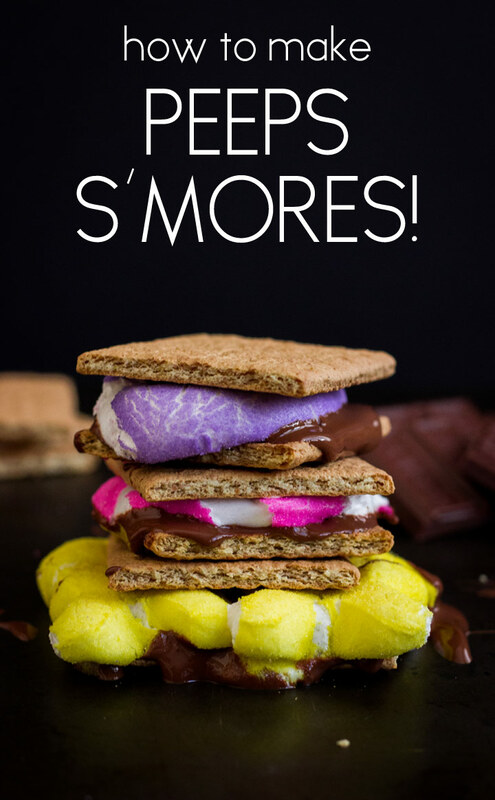 4 steps is all it takes to make these Peeps S’mores so check this out…or, keep scrolling down to see the step-by-step instructions in slowwww mooooooo. Not bad for a first try, right? Step 1: Gather all of the ingredients. 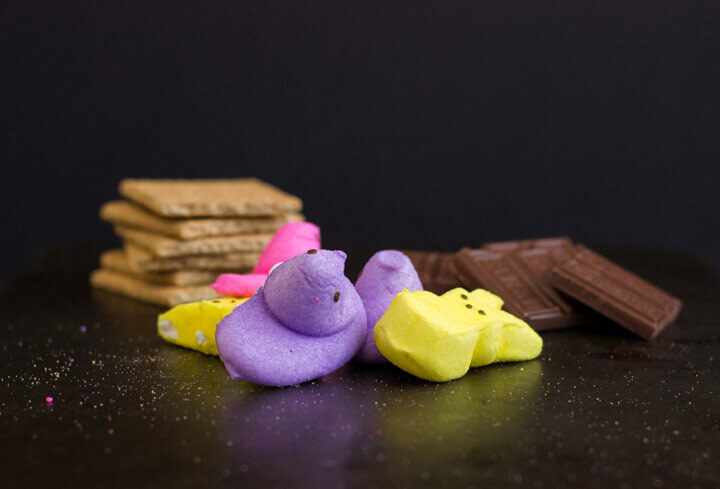 That means: graham crackers, Hershey’s milk chocolate (for heaven’s sake, keep it classic for this one), and whatever combo of Peeps you like! I picked up hot pink, purple, and some yellow bunnies. Warning: there are about 39458 types of Peeps these days so make sure you get the traditional flavor and no fruity flavor. That would be weird). Step 2: Preheat the oven to the broiler setting and place the oven rack on the lowest shelf. 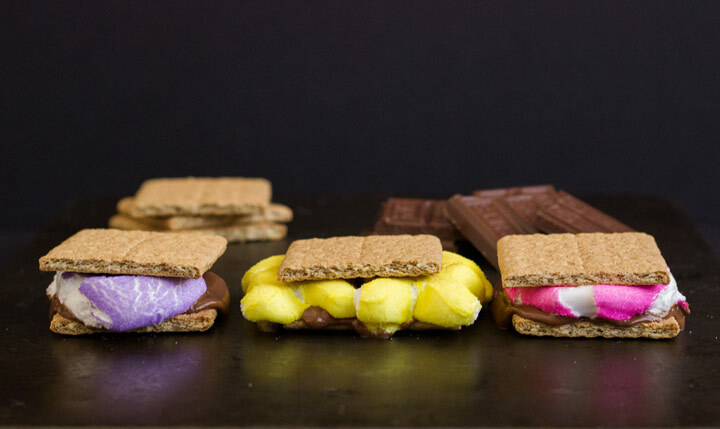 We want the Peeps and chocolate to melt and lightly brown without catching on fire! Step 3: On a baking sheet, assemble the s’mores, leaving the top graham cracker off. One of the benefits of making these in the oven is that you can make a ton at a time. Step 4: Place the tray into the oven for 3-4 minutes, watching it closely. 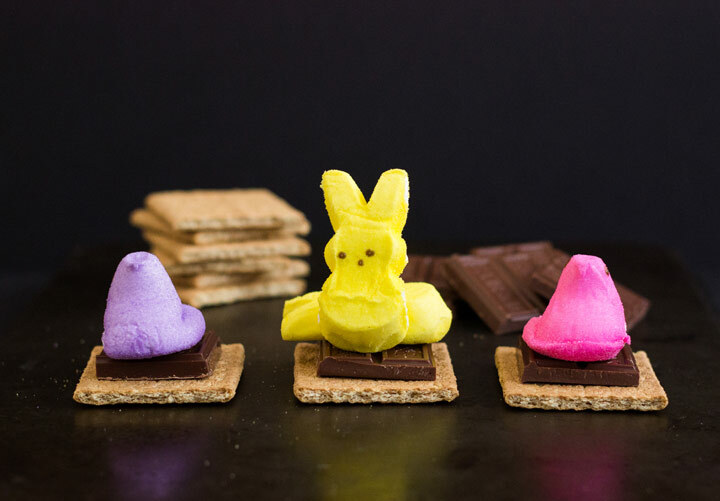 When the Peeps puff up and are lightly browned on top, it’s ready to go! Step 5: Remove from the oven, smush those little guys down with another graham cracker and eat. From the NoshOn.it family to yours, Happy Easter! Agen Bola Terpercaya indo11.com melaporkan, Pebalap tim Ferrari, Sebastian Vettel, berhasil meraih hasil bagus di GP Hongaria. Start dari posisi empat, dia berhasil menjadi juara saat beradu cepat di sirkuit Hungaroring. Dalam balapan yang berlangsung, Minggu (26/7/2015), Vettel menjadi yang tercepat setelah melahap 69 lap dalam waktu satu jam 46 menit 9,985 detik. Ada di posisi kedua adalah pebalap tim Red Bull, Daniil Kvyat, yang mencatatkan waktu 15,7 detik lebih lambat. Daniel Ricciardo ada di peringkat tiga setelah mencatatkan waktu 25 detik lebih lambat dari Vettel yang berhasil menjadi pemenang. Melengkapi posisi lima besar ada driver Torro-Rosso, Max Verstappen, dan juga pebalap McLaren, Fernando Alonso. Dengan kemenangan ini, Vettel kini mengumpulkan 160 poin di klasemen pebalap. Dia tetap ada di posisi tiga. Dia berjarak 21 poin dari Nico Rosberg yang ada di posisi dua. Lewis Hamilton yang mendapatkan delapan angka usai finis di posisi enam, tetap ada di posisi satu klasemen pebalap dengan koleksi 202 angka. Agen Bola Terpercaya indo11.com melaporkan, Arsenal diyakini masih berada di posisi terdepan untuk mendapatkan Fernando Llorente dari Juventus. Striker Spanyol tersebut muncul di radar Gunners, yang diyakini tengah mencari penyerang anyar berkualitas, menjelang musim kompetisi anyar bulan depan. Menurut laporan, Arsenal merupakan tim favorit untuk mendapatkan penyerang berusia 30 tahun, Llorente, yang sebelumnya juga sempat diklaim sebagai target misterius Manchester United di bursa transfer. Dipercaya bahwa Llorente akan membuat Arsenal mengeluarkan dana hingga 8,5 juta poundsterling, namun Arsene Wenger belum lama ini mengatakan bahwa timnya tidak membutuhkan penyerang anyar, usai ia melihat Theo Walcott sebagai alternatif yang bagus untuk membantu Olivier Giroud di posisi tengah.